Creating this Luttrellstown Castle wedding video was an absolute pleasure. I knew from the moment Natalie and Kieran first got in touch, that we’d get along great. Natalie, a native of New Zealand is super chilled, as is her new hubby Kieran. 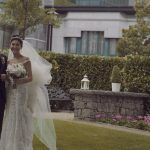 I think their relaxed and chilled out vibe comes across very well in their wedding film. Their June wedding day was one of the hottest of the year. Luttrellstown Castle Resort looked amazing as it basked in the Summer sun. That’s one of the advantages of being a wedding videographer in Dublin, I get to work in amazing wedding venues, just like this. Natalie and her team of bridesmaids got ready about a 10 minute drive from the castle, and the guys got ready at the castle. I loved their speeches! So emotional, and straight from the heart. You’ll hear a few snippets in the wedding video highlights below. “Natalie, you’re my best friend and today you’ll become my wife. I promise to support you, inspire you and love you every day of my life. I hope to make you as happy as you’ve made me. May we have many adventures and grow old together“. Also, watch out for Teddy’s Ice Cream Van! Hope you enjoy this snippet from their Luttrellstown Castle Wedding Video!